The Acer Aspire E15 Full HD Notebook is an attractive, sleek looking laptop that has everything the typical user will need in order to surf the Internet, peruse Facebook and Twitter, watch videos on Youtube, send and receive email, use Microsoft Office and edit photos. It comes with a 15.6 inch full HD color screen that is as bright and sharp as any laptop in its price range, and the 8GB of RAM is plenty for running the zippy Windows 10 that comes pre-installed on it. And the 8th Generation Intel Core i5-8250U is a very fast and capable CPU. What’s more, you’ll be able to also indulge in some moderate gaming thanks to the included NVIDIA GeForce GeForce MX150 (2GB dedicated VRAM) graphics. This machine also has a built-in webcam as well as an 8x DVD-RW drive. Even though this is a powerful mid-range laptop, you’ll enjoy up to 15 hours of battery life under typical operating conditions. Bottom line: If you’re looking for a powerful mid-range laptop that will do most everything you need a laptop to do (without breaking the bank), this powerful Acer is worthy of serious consideration. 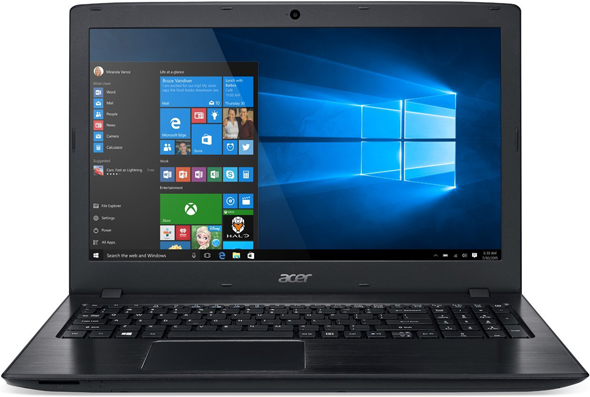 Click here to read more about the Acer Aspire E15 Full HD Notebook at Amazon, including over 600 independent user reviews.